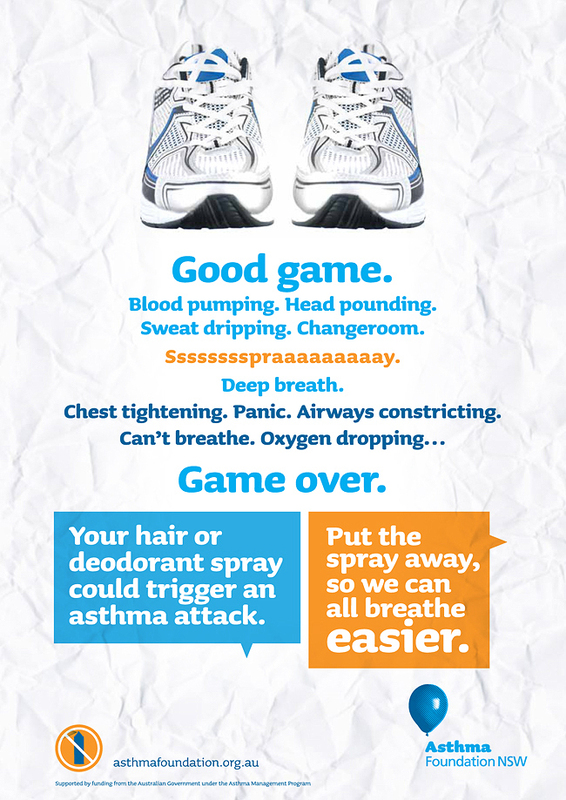 We recently developed this campaign for the Asthma Foundation of NSW, the challenge being to encourage teenagers in school change rooms to switch their hair and deodorant sprays for non-aerosol equivalents. Asthma is a disease which we are all familiar with, and it's particularly rewarding to have the opportunity to help increase awareness for these issues. I just wanted to say thanks for much for all the efforts you and your staff made in developing the posters for us; they have really hit the mark with this group and have appealed to both teachers and students." Thanks to Siobhan from The Writers' Group who helped out with the copywriting for this project as well. It was a wonderfully successful team effort!